This week has been an odd week for reading! I started the week reading the new Stuart Macbride book, In The Cold Dark Ground. I am no further on in it tonight, than I was on Monday night. I just couldn’t get into it, so it’s put aside to read after I’ve read ALL of the previous Logan McRae novels! So, what did I read this week?! I started with the Jefferson Winter shorties by James Carol. I have read and loved his JW novels so I decided I would read the two short stories that have been sitting on my kindle for aaaaaaages!!! 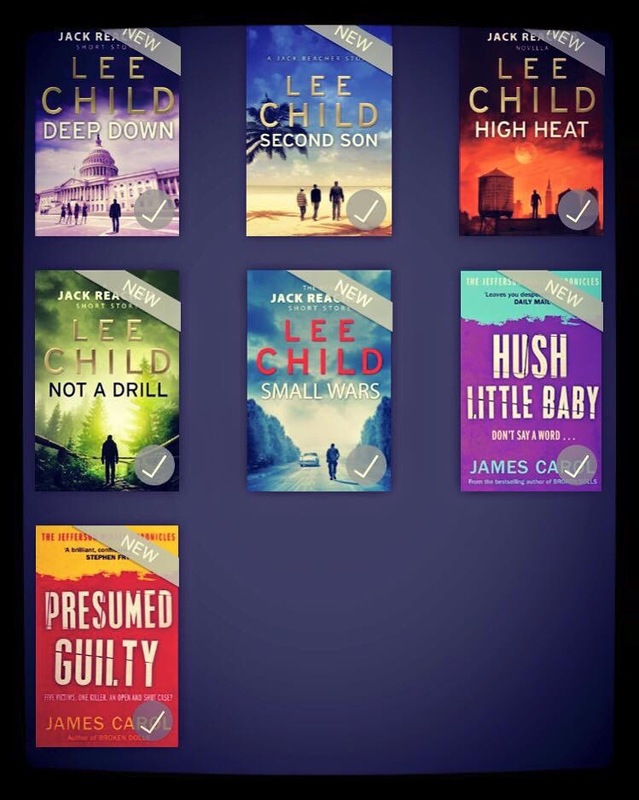 Next up, I finally got to read all of Lee Child’s Jack Reacher short stories. I have been saving Make Me to read, as it’s a long time until septembers Night School release so I figured I may as well have a read of the JR shorties. I really enjoyed these, each one was brilliant in its own way, and they gave a nice bit of background to Jack’s life. I also read Broken Grace by EC Diskin. It was a fairly quick read! You can find my review HERE. Thanks to reading all of those short stories, my Goodreads tally rose significantly and apparently I’m 12 books ahead of schedule 😂 but I know that won’t last long. I’m currently reading The Invisible Guardian by Dolores Redondo and my review will be posted on January 29th as part of the blog tour! I’m off to see Stuart MacBride tomorrow. He’s doing a signing in Leeds. I’ve had a weekend of short stories/novellas. They’re great for inbetween reads! I’m amazed by them though! Authors can pack so much into them!! Loving the weekly round up Kate! I’ve not read any of his either but need to take the opportunity when I can! Kimberley Chambers is coming next month!